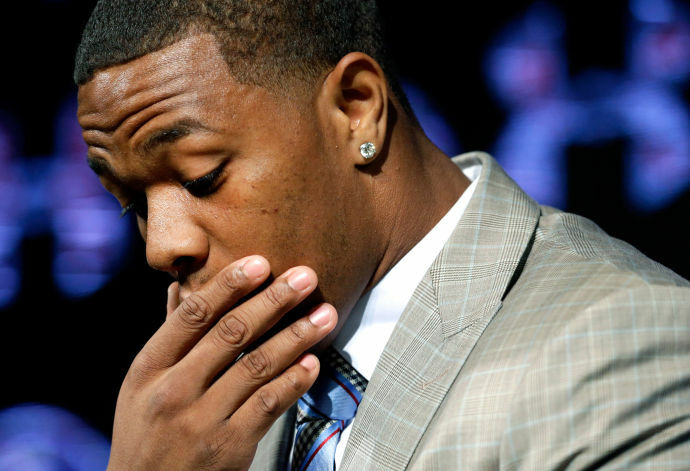 Please don’t think for one second that Ray Rice’s firing and indefinite suspension means that the NFL got it right on domestic violence and player conduct issues. Far from it. Rice’s initial two game suspension and the most recent repercussions are simply the NFL’s knee-jerk reactions to the public learning about an issue that has plagued the NFL, other leagues and this country for a very long time, violence against women. In a sport that thrives on and celebrates egos and aggressive behavior, it should not be shocking that a number of players have been arrested and convicted of crimes that involve inflicting violence towards women. The NFL and its players have never been immune from the issues that the general public deals with on a daily basis. Players deal with substance abuse, domestic violence, drug trafficking, and speeding and parking tickets like the rest of us. For the most part, the NFL and its players deal with these issues on relatively quiet terms. The Rice issue is different; however, because the world got to see him in action. Evidence that would typically remain within the legal system found its way on to the screen of every TV and smartphone across the country. The frenzy that traditional and social media created around his offense made it almost impossible for the NFL, a league whose top priority at times seems to be public relations, to keep quiet about the incident or domestic violence in general. So it reacted—arguably very poorly so. The Ravens’ decision to dismiss Rice and Roger Goodell’s decision to indefinitely suspend him were not a result of a well thought-out strategy or policy. In fact, the new domestic violence policy, which requires a 6-game suspension for the first domestic violence offense and a lifetime ban for the second, hasn’t even been on the books a full month and probably doesn’t even apply to offenses that occurred prior to its enactment such as Rice’s. The most telling of the NFL’s failure to really have a suitable stance on domestic violence; however, is that the same league has done nothing to punish Panthers’ defensive end Greg Hardy, and neither have the Panthers. This past July Hardy was convicted of assaulting his girlfriend and threatening to kill her. While Hardy plans on appealing his conviction, he was sentenced to a 60-day suspended sentence and 18 months on probation*. The NFL’s and the Panther’s reaction to his conviction has been all but silence. That’s not because we know that Hardy’s actions were less egregious than Rice’s but because the NFL and the Panthers really haven’t been embarrassed by Hardy’s actions. There hasn’t been a public outcry to make Hardy an example. As usual, the general public picks and chooses what the next “issue” for debate or protest will be. Oftentimes that decision is based on what shocks the system the most or what gets the most publicity. While it may be “ok” for the public to react that way, the NFL and its teams must not fall victim to that standard. The NFL can’t hand out arbitrary punishments based on what the public gets most upset about. It needs a standard and it needs to stick to that standard. Janay Rice is no more deserving of a league that will stand up against her attacker than is Greg Hardy’s girlfriend or any other player’s female victim. If the league only reacts with strict penalties when the public says it should, then they really aren’t taking a stance at all. *This punishment has been set aside during the appeals process.